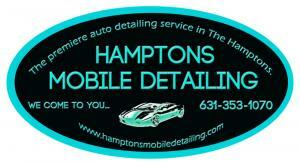 Hamptons Mobile Auto Detailing and Car Wash specializes in mobile vehicle detailing in Suffolk County, NY throughout East Hampton, Southampton, Westhampton, the North Fork, Riverhead and Manorville. Since our inception in 2005, our exclusive, personalized, professional services have been cherished by clients throughout the East End. We realize that your time is just as valuable to you as your automobile. Spending hours of your day to drive to, and wait at, a mechanical car wash is counter-intuitive to living a stress-free life. Our on-site, hand-crafted detailing allows you to instead enjoy your precious time, without risking potential damage to your car from rushed, assembly line service. We pride ourselves in providing individual, satisfaction-guaranteed care for our clientele. Please call 631-353-1070 to inquire about how our services may suit your needs. Hamptons Mobile Detailing services cars, trucks, motorcycles, boats and RVs, on-site, at any location- home, office, marina or club. We provide commercial vehicle detailing for body shops, marinas, car dealerships and insurance companies. From Moriches to Montauk, locations include: Amagansett NY 11930, Bridgehampton NY 11932, East Hampton NY 11937, East Quogue NY 11942, Hampton Bays NY 11946, Montauk NY 11954, North Haven NY 11963, North Sea NY 11968, Northwest Harbor NY 11937, Noyack NY 11968, Quiogue NY 11978, Quogue NY 11959, Remsenburg NY 11960, Sagaponack NY 11962, Sag Harbor NY 11963, Southampton NY 11968, Springs NY 11937, Wainscott NY 11975, Water Mill NY11976, Westhampton NY 11977, Westhampton Beach NY 11978. On the North Fork, from Laurel to Orient Point: East Marion, NY 11939, Greenport, NY 11944, Laurel, NY 11948, Mattituck, NY 11952, Orient, NY 11957, Peconic, NY 11958, Southold, NY 11971. Other areas, from Manorville to Jamesport, include: Aquebogue, NY 11931, Calverton, NY 11933, Jamesport, NY 11947, South Jamesport, NY 11970, Manorville, NY 11949, Northville, NY 11901, Riverhead, NY 11901.